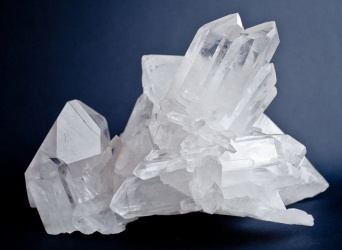 Snow crystals often display flat, faceted surfaces, similar to what you see on a gemstone or with many crystal-glass items. The word facet literally means “little face,” and the sparkles you see when the sun shines on a bank of snow are reflections from the countless little faces of ice crystals. You can also see the mirror-like surfaces of individual snow crystals when you look at them on your sleeve. As you move a crystal to and fro, bright reflections reveal the smooth facet surfaces. 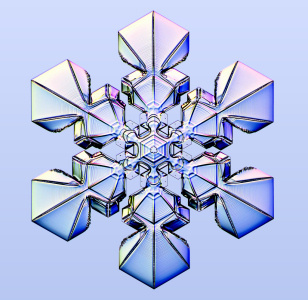 The simplest snowflakes are called hexagonal prisms, like the one shown on the right. 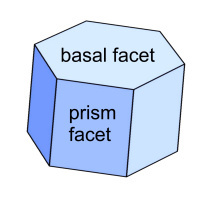 These have two basal facets and six prism facets. So where do these facets come from? 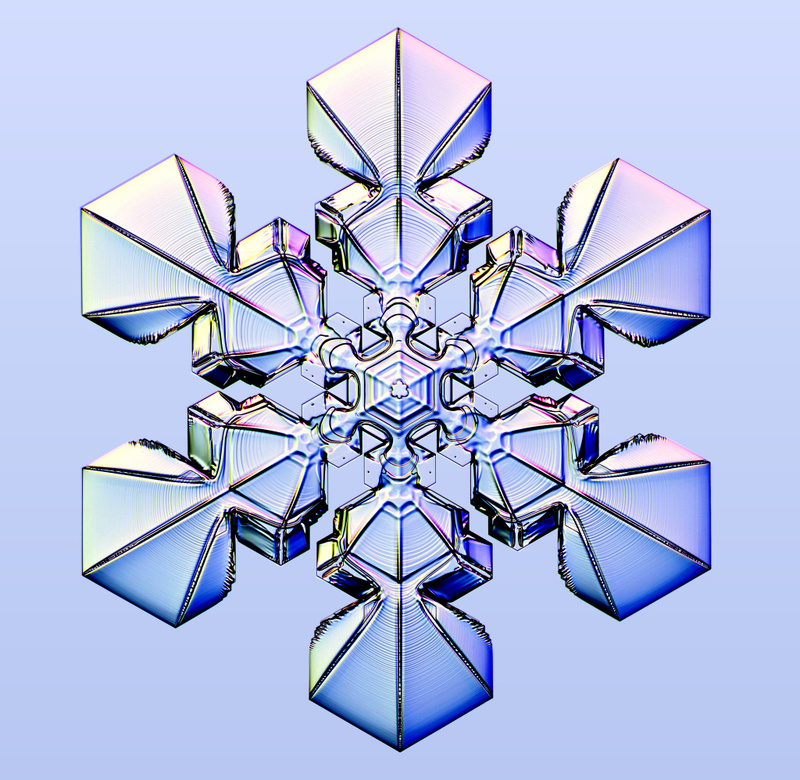 Facets appear on snow crystals as they grow. Water molecules in the air strike the crystal surface and stick, but some stick more readily than others. The water molecules stick especially well to rough spots on the surface, where there are lots of available chemical bonds. They stick less well to smooth areas with fewer bonds. As a result, the smooth surfaces accumulate material more slowly than rough surfaces. The rough parts soon fill in, leaving just the smooth, faceted surfaces. Many crystalline minerals, such as the quartz specimen shown here, form natural facets as they grow. The molecular mechanism is basically the same as for ice -- atoms and molecules stick better on some surfaces than others. The geometry of the facets comes from the geometry of the underlying crystal lattice. 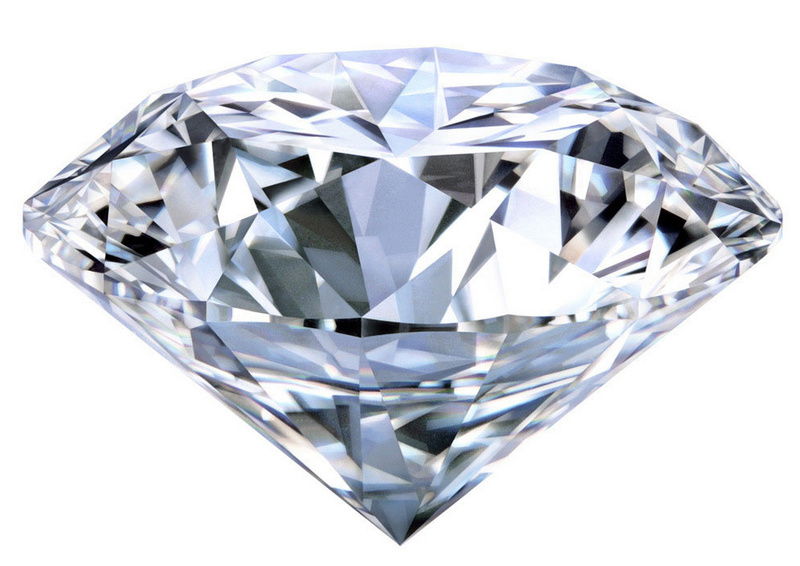 The facets in gemstones are almost invariably artificial, regardless of the type of stone. The diamonds, emeralds, and rubies you find in jewelry all sparkle from their artificial facets, which were carved and polished with a grindstone. The facets on crystal glassware are also carved or molded into place by the glassworker. These faceted works of art can be stunning, to be sure, but they do not possess the natural beauty of the self-faceting snowflake.